umm.. I've knit one row of the neverending cowl in the past 3 days. It will never ever finish. Knitters Review came out with their review of the new Knit Picks line of yarn! Very helpful, I think I'll order some if I'm able to hold back my expenses at stitches west (wishful thinking i'm sure)... 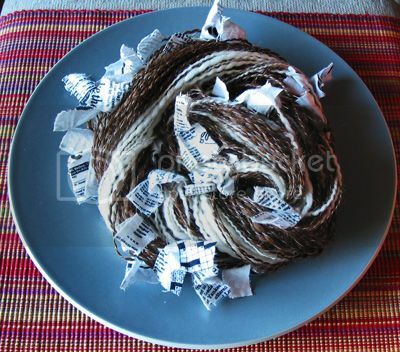 It's just so damn tempting with the amazing prices for wonderful fibers!!! I got to show my friends how I spin when they were over for Chinese New Year dinner. It was embarrasing though when I started the wool on the leader and didn't let enough twist roll in before I let the wool go too far... so the leader broke away from the wool :( After my first stint and performance anxiety, I fell into rhythm and started spinning up a lovely red and yellow yarn. I finished it tonight, but you won't get to see it till later this weekend or Monday. You do get to see the yarn I made for the theme of fiber friday. Thus inspired my yarn "coffee break"
Here's my coffee with a bit of nonfat milk. 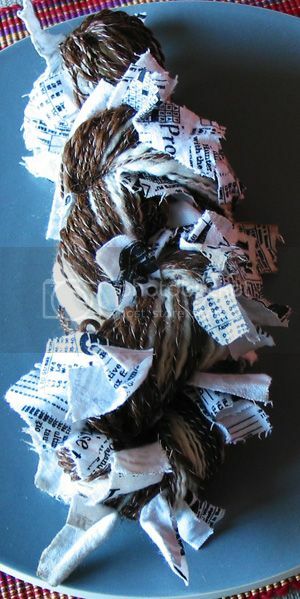 I spun in some newspaper printed cloth strips too! My new friend Lourdes from the Stanford Knit Wit group surprised me today with a gifty! She gave me an amazing lavender filled satchel to make my yarn projects smell DIVINE! 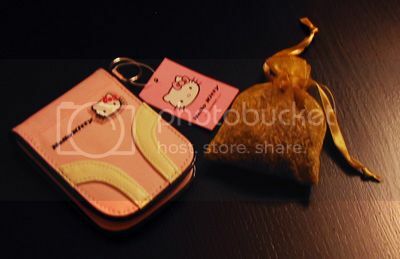 She also thoughtfully gave me a wonderful hello kitty keychain wallet to match my needle holder! It really made my day! I had started the day off with a migraine and sore back, but this was such a lovely pick me up! Thanks again Lourdes! I swear I'm going to spin pieces of cloth in to yarn as soon as I get near my spinning wheel next week! You are so, so inspiring to me! Great yarn! Once my semester is over, would it be too much to ask if you could help me learn to spin? I tried learning last year, but I got too busy to stick with it and now I can't remember how. Darnit! Nancy, I would love to try to teach you how to spin. I'll have to be honest, I'm horrible at drop spindling, but I could definitely teach you on my wheel! It'll be fun! hey, I got the word you are coming to Bennigans tomorrow night - Looking forward to meeting you in person!!!! 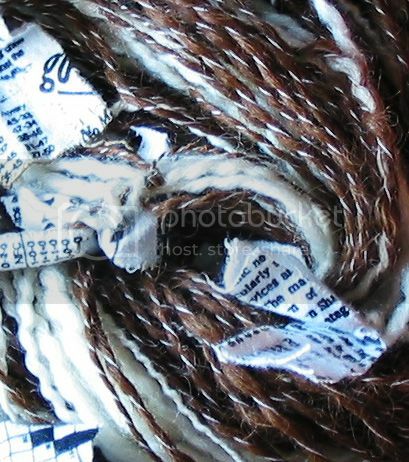 I love your coffee break yarn - and what a fabulous idea to include the strips of newspaper fabric! Thanks Ann and Abigail! I was really happy I found that fabric in my fabric stash! It was too perfect for this. Thanks Stacey! I have the soundtrack too!!!! !